If you’ve followed recent discussions of academic employment trends, you have probably encountered the claim that adjunct professors now comprise an astounding 76% of the academic workforce. This trope statistic is repeated in almost every single article about the “plight” of adjunct faculty and is even the premise of an adjunct unionization advocacy group that calls itself the “New Faculty Majority.” There’s a big problem with this statistical claim though: it’s not accurate. In reality adjuncts do not make up three fourths of the academic workforce. The actual numbers are not even close. A more realistic breakdown may be found in this report by the AAUP, compiled from a 2006 U.S. Department of Education survey. I reproduce the main chart below. Note that several patterns are immediately evident in the data. 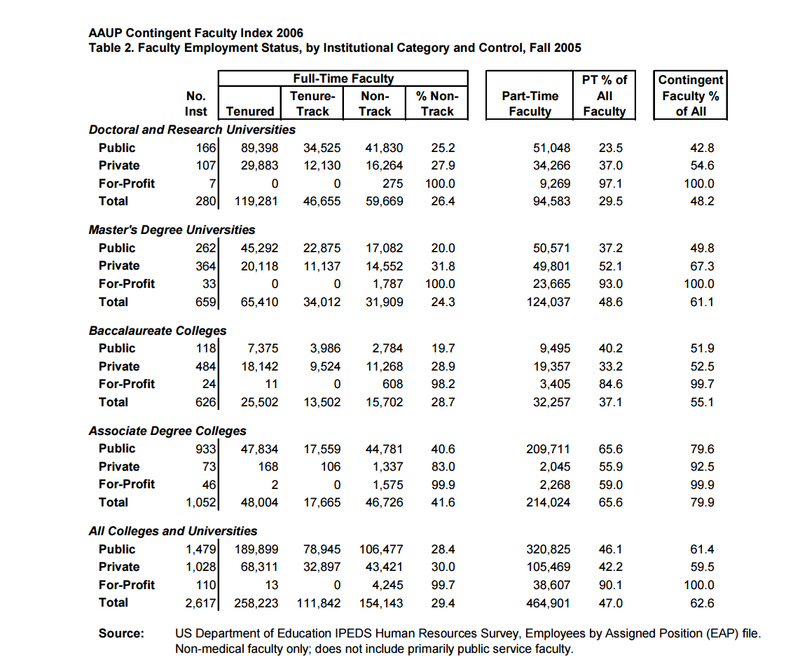 Adjuncts, or “part time faculty,” only make up 29.5% of the faculty at Doctoral and Research Universities. These are the institutions that most Americans think of when they hear the word “university.” They are usually large state universities or well regarded private universities that have undergraduate and graduate degree programs, as well as a distinguished research faculty. Adjuncts make up a slightly larger 37.1% of the faculty at “Baccalaureate Colleges” – a category typically associated with smaller institutions that only offer undergraduate degrees and often emphasize teaching over research. Listed here as “Associate degree colleges,” community colleges do in fact have adjunct majorities in the neighborhood of 65%. This is not a new trend at community colleges though, which often employ working professionals as part time instructors. A PhD is usually not required to teach at a community college, and a large number of their course offerings are in technical trades that are not offered at full universities. While they are an important part of the education system, note that community colleges are NOT what most Americans think of when they hear statistical claims about universities and professors. 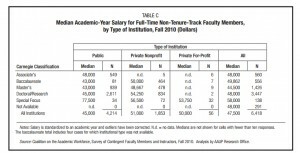 Note that across almost every single category and type of institution, so-called For-Profit universities (think University of Phoenix, Corinthian, and similar institutions with generally low academic reputations and high student loan-dependent tuition rates) disproportionately rely on adjunct faculty. Adjuncts are over 90% of the faculty at For-Profits that offer graduate degrees, and 84.6% at For-Profits that only offer bachelor’s degrees. In fact, these institutions hardly employ any full-time faculty at all. 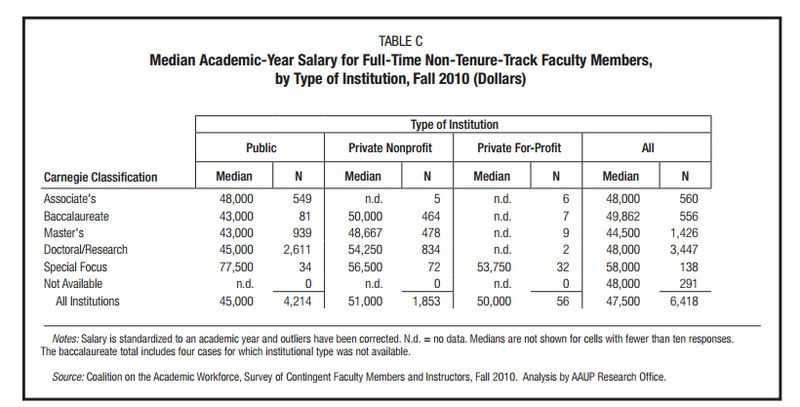 The difference between these positions and tenure-track faculty is that they hold at-will employment. This may be a contract position for a single year, a renewable multi-year contract, a visiting professorship, or a postdoctoral appointment. It is full time employment nonetheless, and it comes with a full salary for the duration of the professor’s employment. According to the survey, about 47% of all faculty at all institution types are adjuncts. The remaining 53% are full time. Note that the only reason this figure is as high as it is comes from the inclusion of community colleges, which traditionally employ higher numbers of adjuncts, and from For-Profits, which almost exclusively employ adjuncts. If it is not already apparent, it is worth reiterating that For-Profit universities are extreme outliers when it comes to adjunct employment. Whereas a large majority of the faculty at traditional colleges and universities are full-time, For-Profit schools basically use nothing but adjuncts. This is highly problematic for statistical interpretation because the inclusion of figures from the For-Profits distorts the reported overall rate of adjunct employment by skewing it upwards. A smaller but still-present skew may also be found by including community colleges in the overall figure. This observation should not be taken as an attempt to downplay or ignore adjunct faculty at For-Profit or community colleges. I call attention to them because most people simply do not visualize these types of institutions when they encounter statistical claims about “college professors.” Practically none of the news stories on the so-called “adjunct majority” indicate that they are referring to patterns that are most evident at places like the University of Phoenix, or that include community colleges where adjuncts have long been the norm. Rather, they invariably suggest that the “adjunct explosion” is taking place at normal 4-year universities. They toss out the 76% statistical trope as if it were true of Harvard, UCLA, Texas A&M, and Ohio State, when nothing could be further from the truth. In short, relax. Traditional 4-year degree higher ed isn’t descending into an adjunct death spiral where three quarters of the faculty are also part time replacements for formerly full time positions. If you take out the For-Profits and community colleges, the adjunct totals are a comparatively tame rate of only about a third of the faculty. 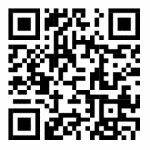 And that rate, I submit, is both a reasonable expectation and a beneficial one as it reflects on the use of adjuncts to augment and supplement classroom offerings that are still very much situated amongst a full time faculty core. This entry was posted by Phillip W. Magness on Friday, August 21st, 2015 at 8:57 pm	and is filed under Uncategorized. You can follow any responses to this entry through the RSS 2.0 feed. Both comments and pings are currently closed.